Ten years ago, we asked each other a simple question: "How can we help?" Fast forward to where we are as an organization today and its still hard to fathom that the Vancouver Canadians Baseball Foundation has reached out to more than 2,500 local children helping them discover the game of baseball, where they have been able to learn skills that have helped them both on the field and in life - directly thanks to your support. Our goal remains simple: Reach deep into our communities throughout the Lower Mainland and through our beliefs and hard work, help as many bright, young children as possible by providing hope, opportunity, self-worth and the chance to chase their dreams. Vince Lombardi, the legendary football coach once said, "The measure of who we are is what we do with what we have," and for the past decade the Vancouver Canadians Baseball Foundation has worked tirelessly to make a difference in a young child's life. We thought if we could just change a lone child's life by providing them with the tools they could use not only on a baseball diamond, but in life, that would be a legacy worth fighting for. Little did we know that in just ten years we would become one of Canada's most aggressive and inspired philathropic group's having connected with more than 2,500 children not to mention their families and support systems. We don't do this for notoriety, but for impact. We want our community to know that there is a place where a child can come to and rid themselves of the daily challenges that can sometime be accompanied by 'life'. Whether it is physical, cognitive or a financial challenge, the Vancouver Canadians Baseball Foundation was solely created to be a way to opening a door that has boundless possibiltities on the other side of it - all created in the spirit of sport. Why do we do what we do? Because its our responsibility to both these amazing kids and to you - our incredible fans. We are both humbled and thankful for your support and we know that there is no use buidling upward unless you have a solid foundation to work from. You are the foundation we build upon, and we thank you for continuing to learn about us, share our story with others and support us in any way that you can. Here is who we are and why we do what we do. Imagine being given the opportunity as a child to play your summer baseball on the same field where the Vancouver Canadians play! That is a reality for more than 300 local children connected to The Boys & Girls Clubs of South Coast B.C. who get the opportunity to come out to historic Nat Bailey Stadium and play within the Vancouver Canadians Youth Baseball League cost-free! Thanks to your generosity, the Canadians are able to outfit every single child within our Youth Baseball League with everything from a certified batting helmet and customized baseball glove and tote bag right through to a personalized jersey t-shirt with a number and team sponsor on the back giving them an identity and confidence in being part of a team. Now add to this the fact that every player receives transportation to and from their Boys & Girls Club regardless of point within the Lower Mainland and also a warm ballpark meal catered for them in between games - all summer long! The recipe is simple. Provide an opportunity for a child to discover the game of baseball in a safe, inclusive environment and provide them with the tools they can use both on and off the field and the possibilities are endless for these amazing kids age 6-13. We receive support not just monetarily, but also in the form of your time which we believe is just as valuable. Would you like to become a mentor or coach for one of our 16 teams this coming summer? To learn more about how you can become involved with our Vancouver Canadians Youth Baseball League contact us directly by calling (604) 872-5232 or by contacting us at staff@canadiansbaseball.com and put Youth Baseball League in the title line. We would be happy to make you a part of our family! One of the Vancouver Canadians first partnership's was with Challenger Baseball, a program dedicated to providing opportunities for children with physical and/or cognitive challenges who were simply looking to enjoy the game of baseball along with their families. After volunteering alongside a number of local Challenger teams from all across the Lower Mainland, Canadians ownership including Jake Kerr, Jeff Mooney and team President Andy Dunn promised to elevate the C's commitment to ensuring these inspiring families had a field to call their own. Located just steps away from historic Nat Bailey Stadium, the Challenger Baseball 'Field of Dreams' is now home to countless memories for all players associated with Challenger as the Canadians along with Variety - The Children's Charity, Jays Care, The Vancouver Board of Parks & Recreation and largely in part to private donations from fans like yourself - we created Western Canada's first fully accessible baseball field designed for wheelchair accessibility and a surface that all children can maneuver across with ease. "The Vancouver Canadians are proud to be a part of this community keepsake. This offers an amazing and much-needed opportunity for these special athletes," stated C's president Andy Dunn at the field's unveiling. Variety - The Children's Charity stepped up as well becoming the field's title partner providing a partnership with the Vancouver Canadians Baseball Foundation that got the field across the finish line. The end result? A field with specialized doorways, synthetic field turf and all the bells and whisteles right to a water fountain designed for the approach of a player in a wheelchair needing some cool refreshment during a game. The Vancouver Canadians Baseball Foundation is proud to have help provide this legacy project for the Hillcrest Community. The goal of the Vancouver Canadians Baseball Foundation when it first was drawn up between owners Jake Kerr, Jeff Mooney and team president Andy Dunn was to create the opportunity for a child who at one point played within our Youth Baseball League and later on in life was able to suit up for the University of British Columbia Thunderbirds Baseball Program, the most celebrated post-secondary baseball platform in Canada. In order to do that we needed to create both the pipeline and opportunity for student-athletes to realize this possibility. As our children began to discover the game of baseball out at Nat Bailey Stadium, we also began the long-term commitment to UBC Baseball to provide scholarship funding to be used exclusively on local players to ensure that those from the Lower Mainland could help offset the cost of a post-secondary education and simply focus on both their studies and the chance to play for the Thunderbirds. Today, more than 60 local players have received scholarship funding directly from the Vancouver Canadians Baseball Foundation and moreso we have created a vision for all players from within our Youth Baseball league that if they can work hard that a scholarship is waiting for them at the finish line. Director of Baseball Operations Terry McKaig and current head coach Chris Pritchett have been extremely committed to scouring the Lower Mainland for local talent and have ensured that the more than $250,000 dollars provided has open the door to a number of student's hoping to better themselves both on and off the field and we believe that our donors should take special pride whenever a local Thunderbirds player helps our university program continue its outstanding Canadian legacy. 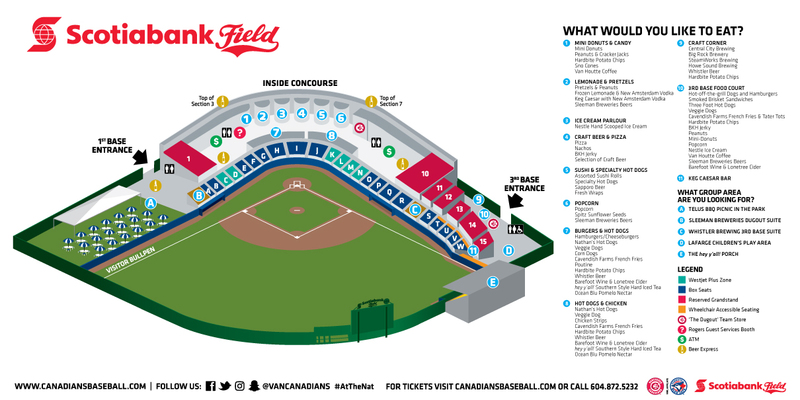 The Vancouver Canadians Baseball Foundation's (VCBF) relationship with The Boys & Girls Clubs of South Coast B.C. is one of the strongest within the philanthropic community as more than 2,500 children have benefitted from this decade long partnership. That said, Canadians co-owner and VCBF Chairman Jeff Mooney along with his wife Suzanne Bolton decided to take our partnreship to the next level in 2017 with the creation of a new Vancouver Canadians Scholarship Program committed to the BCGBC and teenagers looking to continue with their education beyond high school. For the past two years, Jeff and Suzanne have donated $100,000 annually toward scholarships specifically designed for students that attend a Boys & Girls Club of South Coast B.C. on a consistent basis, are active within their community and show a commitment to bettering themselves after high-school. From an young women aspiring to become a hair stylist to an at-risk teenager opting out from the gang life to instead work toward a career with the Vancouver Police Department - this scholarship program is already changing lives. A selection committee within The Boys & Girls Clubs identifies potential recipients and then gets them to submit a package applying for the funding. Upon approval, up to seven (7) teens receive full funding for their post-secondary education right through to completion thanks to the generosity of Jeff and Suzanne. "I was headed down the wrong path, and my mother was losing me to that life because I felt that was a way I could make money for my family," admitted 2018 Scholarship recipient Sharandeep who is working toward becoming a Constable within the Vancouver Police Department. "Receiving this scholarship from the Vancouver Canadians helped take pressure off of my mom and it gave me the hope to become something more."